Regional Pro Tour Qualifiers (RPTQs) for Pro Tour Ixalan take place August 12-13, 2017 and August 19-20, 2017. The format for this round of RPTQs is Standard. Bring your top strategies with you to a Regional Pro Tour Qualifier, and you may be one of the few to emerge from the event with an invitation and airfare to Pro Tour Ixalan! Regional Pro Tour Qualifiers (RPTQs) for Pro Tour Ixalan take place August 12-13, 2017 and August 19-20, 2017. The format for this Regional Pro Tour Qualifier season is Standard Constructed. Players with a Pro Tour Players Club Silver level (as of the date of the Regional Pro Tour Qualifier). Players that won a Preliminary Pro Tour Qualifier from April 29, 2017 until July 2, 2017. Players that finished 1st- through 8th-place at a Regional Pro Tour Qualifier for Pro Tour Hour of Devastation. Players that previously participated in a Regional Pro Tour Qualifier which awards an invitation to Pro Tour Ixalan. Players that won a Magic Online Pro Tour Qualifier Final which awards an invitation to Pro Tour Ixalan. Players that finished in the Top 2 of a Magic Online Championship Series (MOCS) Playoff tournament which awards invitations to Pro Tour Ixalan. Players that won a Magic Online Championship Series (MOCS) Open tournament which awards invitations to Pro Tour Ixalan. Players that finished in the Top 8 or finished with 39 or more match points in an individual-format Grand Prix which awards invitations to Pro Tour Ixalan. Players that finished in the Top 4 or finished with 36 or more match points in a team-format Grand Prix which awards invitations to Pro Tour Ixalan. Players that won a Pro Tour Qualifier (held at a Grand Prix) which awards invitations to Pro Tour Ixalan. Players that finished with 33 or more match points at Pro Tour Hour of Devastation. 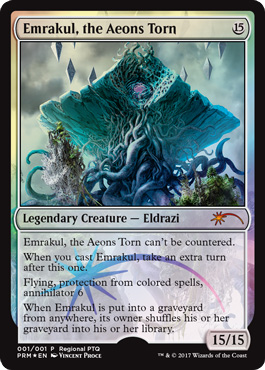 All participants in a Regional Pro Tour Qualifier receive an exclusive Emrakul, the Aeons Torn promo card. The round of Regional Pro Tour Qualifiers taking place between August 12 and August 20, 2017 will have two Magic Online Regional Pro Tour Qualifiers in which qualified players may participate. The first will take place on August 19 at 2 p.m. PT, and the second one will take place August 26 at 5 a.m. PT. The Top 8 players will receive invitations to compete in Pro Tour Ixalan, as well as an invitation to play in the Pro Tour Challenge event at that Pro Tour. The format for these Regional Pro Tour Qualifiers is Standard Constructed. As a reminder, if you play in a Regional Pro Tour Qualifier during a qualifying round, you cannot play in any other Regional Pro Tour Qualifiers during that qualifying round, including Magic Online Regional Pro Tour Qualifiers. Your invitation to compete in a Regional Pro Tour Qualifier only lets you compete in one Regional Pro Tour Qualifier. Tell Us About Your Regional PTQ!